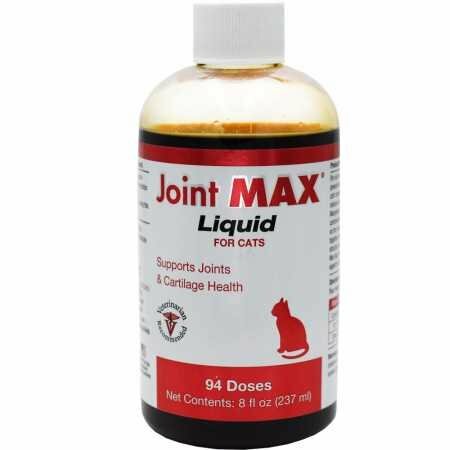 Joint MAX® for Cats liquid is recommended for joint health with powerful active ingredients that enhance the functions of joint and connective tissue as well as antioxidants to help reduce oxidative stress. Created with a mixture of Glucosamine, Chondroitin, Vitamin C, Taurine, MSM, and Zinc, Joint MAX Liquid for Cats is a combination of some of the best, top-quality ingredients on the market with a tasty chicken flavor. Glucosamine and Chondroitin work together to support joint health by supporting the structural integrity of joints and connective tissues. Glucosamine is an easily absorbed natural substance that may stimulate the production of proteoglycans, which help maintain the health and resiliency of joints and connective tissues. Glucosamine also helps to maintain synovial fluid that lubricates the joints and helps sustain joint mobility. Chondroitin provides the building blocks for cartilage, which cushions joints. MSM plays an important role in enhancing tissue pliability by helping to maintain a normal inflammatory response and cushioning tissues. Manganese is included to support bone health while Taurine, Vitamin C, and Zinc act as antioxidants to help remove damaging free radicals from your cat's body. 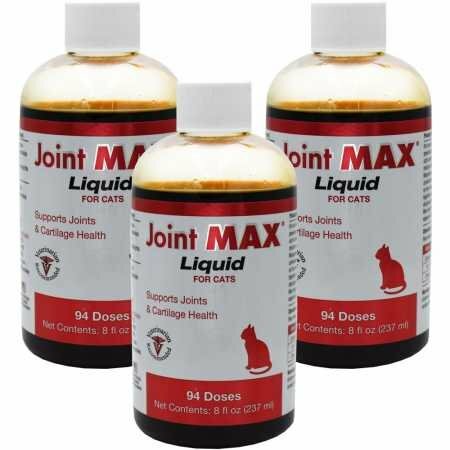 Joint Max Liquid for Cats is a blend formulated to target all aspects of joint health. Joint MAX Liquid for Cats can be a part of a multi-faceted approach to healthy joints because they can be given with prescription drugs. If your cat is undergoing joint discomfort from normal daily exercise or activity, Joint MAX Liquid for Cats can help. For Use In: Cats Key Features: Glucosamine 200mg Chondroitin 80mg Taurine 45mg MSM 40mg Kitty Kuisine Natural Fish Flakes is an all-natural fish treat for cats of all ages. It is made from 100% dried Bonito filets, carved paper thin, and has no additives, preservatives, or by-products. Kitty Kuisine possesses a strong fish-like aroma, which entices all felines. Kitty Kuisine is a good source of taurine (39%). Taurine is used in body growth and tissue repair. 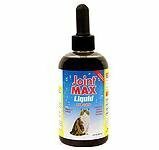 Joint MAX Liquid For Cats is an excellent option for cats suffering from conditions affecting the joints. Joint MAX can also be used long term in normal cats to help keep their joints healthy. Joint MAX Liquid For Cats incorporates a balanced formula of Glucosamine, Chondroitin and Vitamin C into one highly palatable liquid. It also contains MSM, Taurine, and Manganese for added joint support Joint MAX Liquid For Cats helps combat the stiffness and achiness that occurs when the cartilage between your pet's bones breaks down. It naturally lubricates your pet's joints and helps to keep joints healthy. Reviewers Ratings :: My cat has been taking JointMAX liquid for just over 3 weeks. I sincerely thank you for creating a formula for cats that is "doable". I purchased another brand's chewable tablets for him, but a steak knife would not cut those pills and my cat was not interested. I think I already see positive results and am thrilled! Read More Joint MAX Testimonials! * Please refrigerate. Lubricates Joints And Rebuilds Cartilage. Joint MAX Liquid For Cats is an excellent option for cats suffering from conditions affecting the joints. 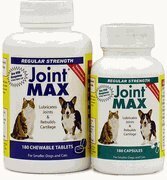 Joint MAX can also be used long term in normal cats to help keep their joints healthy. 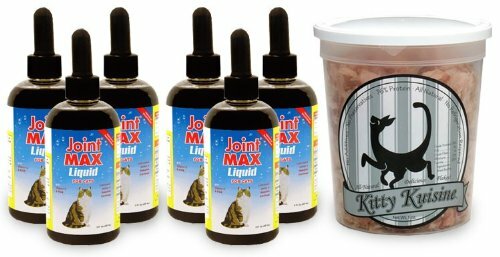 Joint MAX Liquid 6-PACK (48 oz) + FREE Kitty Kuisine For Cats incorporates a balanced formula of Glucosamine, Chondroitin and Vitamin C into one highly palatable liquid. It also contains MSM, Taurine, and Manganese for added joint support Joint MAX Liquid For Cats helps combat the stiffness and achiness that occurs when the cartilage between your pet's bones breaks down. It naturally lubricates your pet's joints and helps to keep joints healthy.